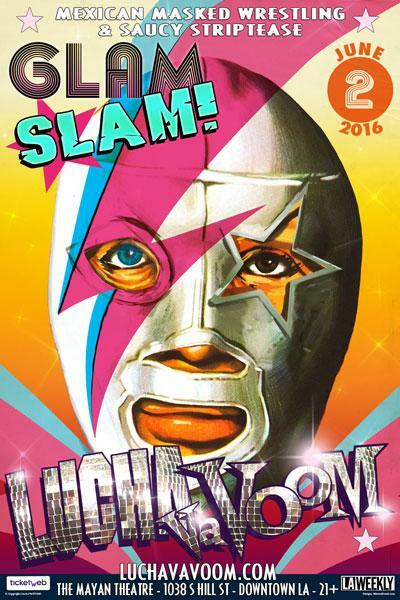 Popular Los Angeles variety show Lucha VaVoom will be holding its “Glam Slam!–Battle For The Belt” on Thursday, June 2, 2016 at the Mayan in Downtown Los Angeles. Tickets for this 21+ event and seated show are on sale now at $40.00-$75.00. Doors are at 7PM and the show is at 8 PM. The event combines Mexican masked wrestling, burlesque and comedy gloriously collide, and is his first-ever championship title, while paying tribute to the glam superstars such as David Bowie and Prince.